Received: January 8, 2018; Revised: January 28, 2018; Accepted: February 9, 2018; Published online: April 1, 2018. Proton pump inhibitors (PPIs) potently inhibit gastric acid secretion and are widely used for treatment of acid-related diseases including gastroesophageal reflux disease and secondary prevention of aspirin/NSAID-induced ulcers. Although clinically important adverse effects of PPIs can occur, just as with other drugs, those are not frequently observed during or after administration. Thus, PPIs are regarded as relatively safe and considered to be clinically beneficial. Recently, PPIs have become frequently administered to patients with functional gastrointestinal diseases or primary prevention of drug-related gastroduodenal damage, even though their beneficial effects for those conditions have not been fully confirmed. PPIs tend to be given for conditions in which the necessity of the drug has not been clarified, thus otherwise rare adverse effects are presented as clinically relevant. Although several PPI-related adverse effects have been reported, their clinical relevance is not yet clear, since the evidence reported in those studies is not at a high enough level, as the majority are based on retrospective observational studies and the reported hazard ratios are low. It is important to administer PPIs only for patients who will gain a substantial clinical benefit and to continue to investigate their adverse effects with high quality prospective studies. The stomach is the only organ that secretes acidic fluid as low as pH 2. Such gastric secretion is important not only for sterilization of bacteria contained in ingested foods, but also for digestion and absorption of various nutritional factors, such as protein, iron, calcium, and vitamin B12. However, since secreted acid may damage the gastrointestinal tract, various types of protective mechanisms, including mucosal mucous/bicarbonate secretion and sphincter contraction of the gastroesophageal junction, are present to prevent gastric secretion-induced gastroesophageal damage. When those protective mechanisms are overcome by acid secretion, gastrointestinal mucosa can become damaged and irritated, resulting in unpleasant symptoms or even organic disease. Such pathological conditions are referred to as acid-related diseases and include gastroduodenal ulcers, gastroesophageal reflux disease (GERD), Barrett’s esophagus, and functional dyspepsia. Employment of PPIs steadily and remarkably increased after starting clinical use for treatment of acid-related diseases, and they are now some of the most frequently prescribed drugs throughout the world,3 with large numbers of affected patients provided ongoing treatment with PPI administration for several years. Along with their popularity, adverse events possibly related to long-term administration of PPIs have been reported, though the level of risk is not high. In this review, we describe the pharmacological characteristics of PPIs and compare them with those of H2RAs. Furthermore, we present a balanced interpretation of reports concerning the advantages and disadvantages of PPI use. H2RAs competitively bind to histamine H2 receptors on the basolateral plasma membrane of parietal cells and inhibit binding of histamine to these receptors, resulting in inhibition of gastric acid secretion mainly during the nocturnal period, since histamine-stimulated acid secretion is important at that time.1,4 H2RAs do not effectively inhibit gastrin- or acetylcholine-induced stimulation of gastric acid secretion, which is important in regard to post-prandial acid secretion. The acid suppressing effect of an H2RA quickly appears when its concentration in plasma increases after the first dose.5 However, as with many types of receptor antagonists, H2RAs show gradually weakened acid suppression, a tolerance phenomenon, following repetitive administration of only approximately 2 weeks.1,4 Thus, H2RAs are considered to be short-distance track sprinters and not long-distance marathon runners. Potassium competitive acid blockers (P-CABs) inhibit acid secretion by binding to the potassium binding site of alpha-subunit of proton pumps with iron bonds.6,7 Although P-CABs show a very quick acid suppressing effect with oral administration, their superior clinical benefits as compared to conventional PPIs are not confirmed, except for Helicobacter pylori eradication therapy and for PPI-resistant GERD.8–11 Various P-CABs have indeed been found to have therapeutic effects similar to those of standard PPIs when used for treatment of uncomplicated GERD.12,13 In fact, revaprazan and vonoprazan, P-CABs available throughout the world, are now used only in several countries including Korea and Japan, different from standard PPIs. PPIs must be activated by highly concentrated hydrogen irons before binding to proton pumps. For that activation, the parietal cells must actively secrete hydrogen irons into the secretory canaliculi when the PPI reaches that network. When gastric acid secretion has been inhibited by a pathological condition or medication, even partially, complete activation of the PPI may be prevented and its acid suppressing effect weakened. Only after acid-induced activation has occurred, PPIs bind to SH residues of proton pump cysteines.17 Since only a part of the proton pump is in an active acid secreting state when a PPI is administered, repeated administrations of the drug are necessary for adequate and complete inhibition of proton pumps. Even during the period of stable acid inhibition following several initial oral doses, acid inhibition during the nocturnal period is weaker with a once daily morning dose, since approximately 25% of proton pumps are replaced by newly synthesized ones within 24 hours and the newly synthesized pumps after the morning PPI administration will begin to secrete acid during the nocturnal period.18 PPIs are almost exclusively metabolized by the liver and not by the kidneys, thus their potency is not influenced by impaired renal function. Furthermore, their acid inhibitory effect does not decrease even after long-term continuous administration, which is different from H2RAs. Therefore, PPIs are effective for long-term acid inhibition, especially during the daytime period, because of their lack of tolerance phenomenon. PPIs are considered to be long-range marathon runners and not short-range track sprinters. PPIs potently inhibit gastric acid secretion, especially during the daytime period following a daily single morning dose. Acid inhibition provided by per-oral administration gradually increases during the first 3–5 days after the start of administration. PPIs do not show tolerance phenomenon, even after long-term treatment. Since nocturnal acid inhibition is not so strong and intra-gastric pH during the nocturnal period remains at around 2.0 in the majority of administered cases, the pre-breakfast plasma gastrin concentration measured in the early morning does not show a remarkable elevation. These characteristics of PPIs may be considered to be advantageous for long-term control of gastric acid secretion. Long-term inhibition of gastric acid secretion is necessary for GERD maintenance therapy and prevention of occurrence of gastroduodenal ulcers during administration of aspirin or NSAIDs.19–23 For control of dyspepsia, which affects patients with functional dyspepsia (FD), acid inhibitors are intermittently administered or given on an on-demand basis, but not continuously. Therefore, GERD maintenance therapy and prevention of drug-related ulcer recurrence are 2 important conditions that necessitate long-term PPI administration. Patients with GERD mainly complain of reflux symptoms after meals, since gastroesophageal refluxes frequently occur during the postprandial period. Since the acid suppressing effect of a single morning dose of a PPI remains potent during the daytime period, PPIs are reported to be effective to prevent recurrence of reflux symptoms and esophageal erosions/ulcers.19–21 With their continuous administration, recurrence of GERD during maintenance therapy for 1 year is reported to be less than 15%, while recurrence within 1 year without maintenance therapy is estimated to be greater than 50%.24,25 When the preventive effect of PPIs for GERD recurrence was compared with that of H2RAs, PPIs were found to be much more effective. Their long-term administration may also be effective for prevention of neoplastic transition of Barrett’s esophagus to dysplastic Barrett’s esophagus, such as an adenocarcinoma. It has not been completely established whether PPIs effectively prevent dysplastic changes of Barrett’s esophagus. However, no report has indicated that these drugs aggravate dysplastic changes, though several have suggested that they effectively prevent dysplastic changes.26 Thus, long-term maintenance therapy with a PPI is effective for preventing recurrence of GERD and may also prevent neoplastic progression of Barrett’s esophagus. Long-term PPI administration is also helpful for preventing recurrence of aspirin-induced gastroduodenal ulcers and is more effective than H2RAs, with a decrease in recurrence to approximately one-tenth of that seen in placebo-treated groups.23,27–29 Similarly, in cases administered with an NSAID, PPIs were reported to decrease the recurrence rate to one-tenth of that of a placebo group over a 6- to 12-month observation period.22 Since many patients with cerebrovascular or cardiovascular diseases are treated with aspirin as an anti-thrombotic drug, prevention of aspirin-induced ulcers is critically important for prevention of NSAID-induced ulcers. Thus, PPIs are first-line drugs used for the prevention of aspirin/NSAID-related ulcer recurrence, and their continuous administration is effective and potent for the prevention of recurrence as well as maintenance therapy of GERD. All clinical drugs have both therapeutic and adverse effects, including PPIs. Since the basic chemical structure of available PPIs is similar, the adverse effects of the drugs are also similar and can be divided into 2 types, those related and unrelated to acid inhibition. The majority of acid inhibition-related adverse effects are observed during long-term treatment with a PPI, while those unrelated to acid inhibition are observed in patients with long-term as well as those with short-term treatment (Table). 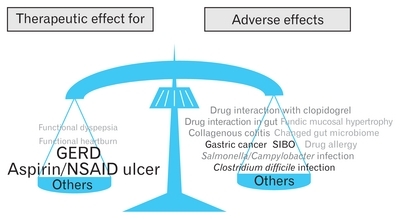 The relative importance of acid inhibition unrelated adverse events is shown in Figure 1. Anaphylaxis, pancytopenia, agranulocytosis, thrombocytopenia, hemolytic anemia, acute liver damage, Lyell syndrome, Stevens-Johnson syndrome, interstitial nephritis, and rhabdomyolysis may occur in a small number of cases treated with a PPI, as well many other types of drugs.30–34 Since prediction of occurrence of these possibly life-threatening effects is difficult, it is important to correctly consider indications and administer PPIs only to patients who truly need potent acid suppression. In addition, patients should be instructed to report unexplained skin eruptions, fever, or general malaise appearing after starting a PPI administration to their attending physician without delay. Doctors also should check for possible adverse effects within the first few weeks after starting an administration by scheduling follow-up consultation sessions. Diarrhea is frequently experienced by patients being treated with PPIs.35 Some cases of PPI-related diarrhea may be complicated with collagenous colitis, which is characterized by diarrhea and histo-pathological identification of thick collagen bands beneath the colonic epithelium. According to the case-control study, PPI use is associated with an increased risk for collagenous colitis (hazard ratio 4.5).36 Although a variety of drugs, including all available PPIs, are reported to be possible pathogenetic factors of collagenous colitis, the PPI lansoprazole is most frequently reported as responsible.37 Although the pathogenetic mechanism of PPI-related as well as that of non-drug-related collagenous colitis has yet to be clarified, PPI-induced augmentation of collagen gene expression in colonocytes may partially be responsible for it.38 PPIs-related collagenous colitis usually resolves spontaneously after cessation of the drug.39 Therefore, when patients complain of diarrhea after starting a PPI, possible occurrence of collagenous colitis must be considered. Many drugs including PPIs, diazepam, phenytoin, and warfarin are at least partially degraded by hepatic drug metabolizing enzyme CYP2C19. However, the capacity of that enzyme is not large sufficient, thus PPI administration may decrease the level of degradation of other drugs, augmenting their pharmacological effects. On the other hand, for activation of clopidogrel, CYP2C19 enzyme activity is necessary. Therefore, PPIs administration in patients treated with clopidogrel may decrease its anti-thrombotic activity and increase the risk of cardiovascular events. This consistent pharmacodynamic study result, however, was not confirmed in clinical studies. Firstly performed epidemiological study supported this concept and suggested that PPIs interfered with clopidogrel activation and elevated cardiovascular risk.53 However, some retrospective studies thereafter did not support this.54,55 A meta-analysis of retrospective studies suggested the possible risk of increased major cardiac events in association with PPI administration in cases chronically treated with clopidogrel, though not all such studies reached the same conclusion.56,57 The level of evidence presented by those retrospective studies was not adequate to make clinically relevant conclusions. Additionally, 3 prospective randomized controlled studies, including the famous (the Clopidogrel and the Optimization of Gastrointestinal Events Trial) COGENT study, suggested a lack of PPI-induced increase of major cardiac events, even when administered to patients treated with clopidogrel.58–60 Although further studies may be necessary to conclude whether PPIs and clopidogrel have clinically meaningful interactions, the available data in the literature considers to not prevent the use of PPIs in patients treated with clopidogrel, if they need PPI administration. Increased risks of cerebral ischemic diseases, ischemic cardiac diseases un-related to clopidogrel administration and even decreased life expectancy were recently reported in cases treated with long-term PPIs administration.68–71 However, studies that presented findings suggesting those as risks were retrospectively performed using a database constructed for other purposes, and no prospective investigation has been done to determine the true risk of these pathological conditions developing from PPI use. The reliability of those retrospective studies is not high. Only a large risk over odds ratio (OR) greater than 2–3 is considered to be clinically relevant. Since the reported OR values of these diseases are 1–2, they may not be clinically relevant. Furthermore, these studies did not fill the Hill criteria for Causation.72,73 Additional studies, possibly even prospective investigations, are needed in the future to establish the true risk of PPI administration in regard to these diseases. The relative importance of acid inhibition related adverse events is shown in Figure 2. Bacteria that may cause a gastrointestinal infection can be divided into acid-resistant and acid-labile. Acid-labile bacteria, including Salmonella, Campylobacter, and the vegetative form of Clostridium difficile, may have an increased chance to infect and grow in the gastrointestinal tract when gastric acid secretion is suppressed by a PPI.82,83 As for infection with Salmonella and Campylobacter, many retrospective studies have suggested increased infection rates during administration of PPIs, though some cohort studies have failed to show such increased infection in PPI-treated cases.84,85 Because of diverse study results, it is difficult to conclude whether PPIs increase the risk of Salmonella and/or Campylobacter infection. C. difficile enteritis is an increasing problem especially in western countries, because of the growing population of strains resistant to antibiotics. Several studies have examined the risk of C. difficile enteritis in cases treated with PPIs, which found that long-term administration may be responsible for an increased risk, whereas short-term treatment may not increase that risk.84,86 The study results investigating whether PPI administration increases risk of recurrent C. difficile enterocolitis and/or severe-complicated diseases are not consistent.87–90 Thus, long-term administration of PPIs should be limited to patients who truly need medication, as that may increase the risk of C. difficile enteritis to an OR of 1.5–2.0. Based on a study done on experimental animals, long-term PPI-administration was found to develop gastric neuroendocrine tumors with accompanying hypergastrinemia at least in rodents. The result of the animal study temporally halted the clinical development of PPIs in the past.97 After the start of worldwide clinical use of PPIs, only several case reports have noted cases of PPI administration-related gastric neuroendocrine tumors, though the reliability of those reports is not adequate. Some are too limited to be convincing of a pathogenic role of administered PPI and some cases were reported to have developed a carcinoid tumor soon after start of administration.98,99 In addition, the prognosis of patients with type 1 carcinoid tumors has recently been reported to be quite good even without treatment, though endoscopic resection is standard.96 These reports suggest that the risk of gastric carcinoid tumor development during long-term PPI administration is not clinically relevant, though periodic endoscopic screening may be recommended during the period of administration. Hypergastrinemia increases proliferation of gastric mucosal stem cells located in the neck area of gastric fundic glands in addition to gastric ECL cells.100,101 Therefore, hypergastrinemia caused by PPIs increases gastric fundic mucosal thickness and gastric acid secretion when the administration is stopped.102 Such thickening of gastric fundic mucosa is reported to be especially prominent when these drugs are administered for a long period to patients not infected with H. pylori. Furthermore, similar thickening has been observed in cases of Zollinger-Ellison syndrome. An abrupt stop of PPI administration in patients with Zollinger-Ellison syndrome is accompanied by an abrupt rebound of acid hypersecretion, resulting in acid-induced complications such as higher grade reflux esophagitis.103 Therefore, long-term PPI administration will lead to proliferation of gastric fundic mucosa, resulting in rebound acid hypersecretion once the administration is stopped. This phenomenon may make intermittent PPI use difficult, thus affected patients will likely be treated with the widely used long-term administration for maintenance of GERD. PPIs have been reported to change the gut microbiome and increase the number of Streptococcus organisms, which densely colonize the oral cavity.104–106 In addition, PPI administration increases bacterial density in the duodenum and jejunum. The presence of 100 000 bacterial colonies/mL in small intestinal contents is called small intestinal bacterial overgrowth (SIBO). PPI administration is considered to be a risk factor of SIBO.107 These results suggest that PPIs decrease gastric acid secretion and the bactericidal effect of the gastric juice, with a resulting increase in microbial density in the small intestine and in Streptococcus even in the gut microbiome. In addition, the possible lability of PPIs administered to patients with trans-oral infection of other pathogenetic bacteria has been suggested, though the clinical relevance of that has not been clarified. 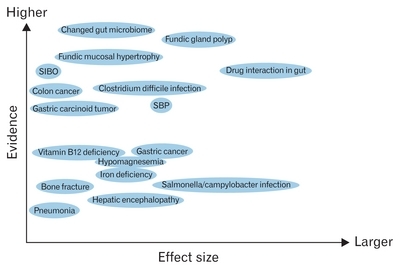 At present, the clinical importance of a changed microbiome in PPI-treated patients is not clear. Magnesium, important for regulation of neuromuscular and various enzyme activities, is absorbed from the small intestine and excreted in urine. Therefore, chronic diarrhea is a risk factor for hypomagnesemia and affected patients may experience convulsions, muscle cramps, seizures, or anorexia. Chronic PPI administration has been reported to cause hypomagnesemia, possibly through decreased absorption of magnesium in the small intestine.108,109 Other reports, on the other hand, did not confirm the association between PPI administration and hypomagnesemia.110 A reported systematic review and meta-analysis of observational studies suggested the statistically significant association between PPI administration and hypomagnesemia, although the hazard ratio is modest (1.43) and the causation relationship is not clear.111 One of the reported possible mechanism is that the PPIs-induced alteration in the gut microenvironment especially intra-luminal pH, may change the activity of gut magnesium transporters including transient receptor potential melastin 6 and 7.108,112 Based on this hypothesis, hypomagnesemia may be classified as an acid inhibition related adverse event. Although the number of reported cases with clinically meaningful hypomagnesemia that developed during chronic PPI administration is not high, periodic measurement of serum magnesium concentrations may be necessary to detect the possible subclinical hypomagnesemia. Some nutrients require gastric acid for effective absorption, including iron, calcium, and vitamin B12. Long-term PPI administration may decrease gastric acid secretion, especially during the daytime postprandial period, thus decreasing levels of iron, calcium, and vitamin B12 absorption, and possibly causing a pathological condition associated with lack of those nutrients. For absorption of calcium, gastric acid may have important roles. Decreased absorption of insoluble calcium such as calcium carbonate during potent acid suppression has been reported, though that caused by diet during acid suppression has not been clearly shown.117 Such decreased absorption from the diet, if caused by PPI administration, may cause calcium deficiency, leading to osteoporosis and increased risk of bone fracture, although a study did not support the concept that PPI administration decreases calcium absorption.118 Several observational studies have suggested elevated femoral neck fracture risk in patients treated with PPIs.119–121 Surprisingly, no positive correlation between the length of PPI administration and increased risk of fracture has yet been shown.119 Some prospective observational studies failed to show decreased bone mineral density during long-term administration of PPIs, and other studies have shown that their administration did not increase fracture risk in cases without additional clear risk factors related to osteoporosis and bone fracture.122–125 Thus, the results of many studies suggest that PPI use does not increase the risk of osteoporosis or bone fracture. Gastric fundic gland polyps are small and benign growths found in the gastric fundic gland area in cases without H. pylori infection, which consist of hyperplastic and often cystic fundic glands. When PPIs are continuously administered to H. pylori-negative patients, multiple fundic gland polyps are reported to develop in fundic gland mucosa.130–132 Though beta-catenin mutations have been reported to be found in some fundic gland polyps found during PPI administration, these polyps show regression and finally disappear when PPI administration is stopped.133,134 Therefore, those polyps formed during chronic PPI administration are considered to be not clinically important, although follow-up endoscopy is still necessary for detection of possible neoplastic changes. In patients infected with H. pylori, the administration of PPIs has been repeatedly reported to augment mucosal inflammation and accelerate mucosal atrophy, which may increase the risk of gastric cancer, although some diversities in study results are found.91,135,136 Furthermore, some observational studies have suggested that PPIs increase gastric cancer risk in patients infected with H. pylori, whereas others have presented contrasting findings.132,137–139 A recent study reported that PPI administration even after successful eradication of H. pylori augmented the risk of gastric cancer up to a hazard ratio value of 4.29.140 The level of risk reported by different investigators is not homogenous, thus it is difficult to reach a conclusion based on current findings. Additional studies will be necessary to determine whether PPIs increase gastric cancer risk in patients with H. pylori infection, as well as those who have successfully undergone eradication. Some colon cancer cells have been reported to have gastrin receptors, which were found to be linked to cell proliferation.141,142 Therefore, hypergastrinemia caused by PPI administration may stimulate neoplastic colonic cells and increase the risk of colon cancer. Based on an observational study, the long-term use of PPI did not influence the frequency, growth or histology of colonic adenomatous polyps.143 Two large independent observational studies investigated the risk of colon cancer during chronic administration of PPIs, and both found no evidence of increased risk.144,145 Therefore, PPIs are considered not to increase the risk of colon cancer despite their association with elevated plasma gastrin levels. Recently, in addition, PPI administration is also reported to be associated with hepatic encephalopathy in patients with cirrhosis.70,148 The PPI-induced gut microbial changes or PPI-induced hypomagnesemia and vitamin B12 deficiency are considered to be possible links between hepatic encephalopathy and PPI administration, though the precise mechanism is not yet clarified. The risk of PPI use in cases with cirrhosis, thus, need to be considered, though these study results are just an association and do not show the causal relationship. PPI administration is necessary in some cases with cirrhosis, since PPI decreases the risk of esophageal varix rupture and the occurrence of peptic ulcers.151,152 Balancing the benefit and risk of PPI administration should always be considered when doctors prescribe PPIs to cases with liver cirrhosis. Absorption of several different drugs is under the strong influence of gastric acid secretion, such as digitalis, which is degraded by gastric acid in the stomach. Therefore, the pharmacological effect of digitalis and others may be augmented during PPI administration. On the other hand, effective absorption of several drugs including itraconazole and atazanavir becomes difficult when PPIs are administered, since their solubility is low at neutral pH. Drugs that are not absorbed and remain functioning in the gastrointestinal tract, such as polycarbophil calcium, may partially lose their potency with PPIs, since acid-induced activation of those drugs is incomplete in an acid neutral environment. Although all drugs that inhibit gastric acid secretion may cause drug interactions in the gastrointestinal tract, the interaction with PPIs may be strong because of their potent acid suppression. All PPIs currently available show both beneficial and adverse effects. Therefore, of course, the appropriate indications of PPIs therapy should be confirmed as a first step when we decide the potential administration of PPIs.153,154 When deciding when to administer any medicine, it is important to re-confirm that the beneficial effects will outweigh any potential adverse events. The beneficial therapeutic effects of PPIs for the treatment of GERD, gastroduodenal ulcers, and H. pylori eradication are quite clear, while their effects for symptomatic improvement in patients with functional dyspepsia and for patients with esophageal hypersensitivity are limited.155 PPIs are not effective for symptom improvement in functional heartburn cases. Therefore, when administered to patients with functional dyspepsia, esophageal hypersensitivity, or functional heartburn, attention must be given to potential adverse effects, even if the risk is reported to be low. To gain only a small therapeutic benefit, a low risk of adverse effects should be avoided. On the other hand, when the expected therapeutic effect is large enough, a low risk of adverse effects can be accepted. Thus, expected therapeutic effects must always be balanced with possible adverse events (Fig. 3). The majority of adverse effects related to PPI administration are reported to occur after long-term administration has been given. For symptom control in patients with low grade reflux esophagitis, intermittent or on-demand administration may be effective enough. Low grade reflux esophagitis, such as Los Angeles grade A or B, has repeatedly been reported not to progress to high grade reflux esophagitis or develop clinically relevant complications, including bleeding and esophageal stricture, even without intensive treatment. Therefore, long-term PPI administration may be necessary for maintenance treatment mainly in patients with high grade reflux esophagitis, Los Angeles grade C or D. Patients with high grade reflux esophagitis are reported to comprise only 5–10% of all cases of reflux esophagitis. For treatment of low grade reflux esophagitis and non-erosive GERD, long-term PPI administration should be avoided, if possible. Long-term PPIs are also frequently given for prevention of NSAID- or aspirin-related ulcers. High dose NSAID/aspirin administration, elderly age, past history of ulcers, and bleeding ulcers are well known to increase the risk for ulcer recurrence. Therefore, for risky cases, PPI administration for prevention of recurrence is considered to be a reasonable option. However, for patients without such risks, long-term PPI use should be avoided. Majority of reported adverse effects of PPIs are conflicting and their clinical impacts are not large enough. Since most of the studies concerning the adverse events of PPIs are retrospective and observational, the inclusion risks of potential bias are not negligible. In these conditions, only the study results showing the large clinical impact can be reliable and clinically important. Therefore, the presence of clinically meaningful risk of long-term PPIs administration is considered to be not fully established. However, even under these conditions, specialists in gastroenterology must always be careful to balance the merits and demerits of long-term PPI administration in daily medical practice. In conclusion, known risks of long-term PPI administration must be considered in clinical practice, though the majority of evidence presented in regard to such risks is not consistent or adequate to make firm conclusions. Fig. 3. Beneficial effects and possible adverse effects need to be balanced, when proton pump inhibitors (PPIs) are administered as many other drugs. Beneficial effects of PPIs for the long-term treatment of gastroesophageal reflux disease (GERD) and prevention of aspirin/non-steroidal anti-inflammatory drug (NSAID)-induced ulcers are strong enough when PPIs are administered only to appropriate patients. PPIs also have several acid-inhibition related and unrelated adverse effects although the clinical impacts of these adverse events are not so serious. However, balancing beneficial and adverse effects as well as selecting appropriate patients who will get larger benefits by the PPIs administration are critically important. SIBO, small intestinal bacterial overgrowth. Conflicts of interest: Outside of this article, Yoshikazu Kinoshita received honoraria from Eisai pharmaceutical Co, EA pharma, Zeria pharmaceutical Co, Astellas pharma, AstraZeneca KK, Takeda pharma, Daiichi-Sankyo pharma, Abbott Japan, Otsuka pharma, Sucampo pharma, Mylan, Sato pharma, Ono pharma, Taisho-Toyama pharma, Sumitomo-Dainippon pharma, and Mochida pharma. Author contributions: Yoshikazu Kinoshita wrote this article; and Norihisa Ishimura and Shunji Ishihara gave important information and advices for the construction of this article. All of them read the final version of the article and agreed the contents of the article. Komazawa Y, Adachi K, Mihara T, et al. Tolerance to famotidine and ranitidine treatment after 14 days of administration in healthy subjects without Helicobacter pylori infection. J Gastroenterol Hepatol 2003;18:678-682. Iwakiri K, Kinoshita Y, Habu Y, et al. Evidence-based clinical practice guidelines for gastroesophageal reflux disease 2015. J Gastroenterol 2016;51:751-767. Lanas A. We are using too many PPIs, and we need to stop: a European perspective. Am J Gastroenterol 2016;111:1085-1086. Fujisawa T, Adachi K, Komazawa Y, et al. Helicobacter pylori infection prevents the occurrence of the tolerance phenomenon of histamine H2 receptor antagonists. Aliment Pharmacol Ther 2004;20:559-565. Adachi K, Komazawa Y, Mihara T, et al. Comparative study of the speed of acid-suppressing effects of oral administration of cimetidine and famotidine. J Gastroenterol Hepatol 2005;20:1012-1015. Shin JM, Inatomi N, Munson K, et al. Characterization of a novel potassium-competitive acid blocker of the gastric H,K-ATPase, 1-[5-(2-fluorophenyl)-1-(pyridin-3-ylsulfonyl)-1H-pyrrol-3-yl]-N-methylmethanamine monofumarate (TAK-438). J Pharmacol Exp Ther 2011;339:412-420. Scott DR, Munson KB, Marcus EA, Lambrecht NW, Sachs G. The binding selectivity of vonoprazan (TAK-438) to the gastric H+, K+-ATPase. Aliment Pharmacol Ther 2015;42:1315-1326. Sakurai Y, Nishimura A, Kennedy G, et al. Safety, Tolerability, pharmacokinetics, and pharmacodynamics of single rising TAK-438 (vonoprazan) doses in healthy male Japanese/non-Japanese subjects. Clin Transl Gastroenterol 2015;6:e94. Sakurai Y, Mori Y, Okamoto H, et al. Acid-inhibitory effects of vonoprazan 20 mg compared with esomeprazole 20 mg or rabeprazole 10 mg in healthy adult male subjects--a randomised open-label cross-over study. Aliment Pharmacol Ther 2015;42:719-730. Ashida K, Sakurai Y, Hori T, et al. Randomised clinical trial: vonoprazan, a novel potassium-competitive acid blocker, vs. lansoprazole for the healing of erosive oesophagitis. Aliment Pharmacol Ther 2016;43:240-251. Murakami K, Sakurai Y, Shiino M, Funao N, Nishimura A, Asaka M. Vonoprazan, a novel potassium-competitive acid blocker, as a component of first-line and second-line triple therapy for Helicobacter pylori eradication: a phase III, randomised, double-blind study. Gut 2016;65:1439-1446. Kahrilas PJ, Dent J, Lauritsen K, et al. A randomized, comparative study of three doses of AZD0865 and esomeprazole for healing of reflux esophagitis. Clin Gastroenterol Hepatol 2007;5:1385-1391. Dent J, Kahrilas PJ, Hatlebakk J, et al. A randomized, comparative trial of a potassium-competitive acid blocker (AZD0865) and esomeprazole for the treatment of patients with nonerosive reflux disease. Am J Gastroenterol 2008;103:20-26. Shirai N, Furuta T, Moriyama Y, et al. Effects of CYP2C19 genotypic differences in the metabolism of omeprazole and rabeprazole on intragastric pH. Aliment Pharmacol Ther 2001;15:1929-1937. Adachi K, Katsube T, Kawamura A, et al. CYP2C19 genotype status and intragastric pH during dosing with lansoprazole or rabeprazole. Aliment Pharmacol Ther 2000;14:1259-1266. Gedda K, Scott D, Besancon M, Lorentzon P, Sachs G. Turnover of the gastric H+, K+-adenosine triphosphatase alpha subunit and its effect on inhibition of rat gastric acid secretion. Gastroenterology 1995;109:1134-1141. Huber R, Kohl B, Sachs G, Senn-Bilfinger J, Simon WA, Sturm E. Review article: the continuing development of proton pump inhibitors with particular reference to pantoprazole. Aliment Pharmacol Ther 1995;9:363-378. Katsube T, Adachi K, Kawamura A, et al. Helicobacter pylori infection influences nocturnal gastric acid breakthrough. Aliment Pharmacol Ther 2000;14:1049-1056. Hongo M, Fujimoto K, Gastric Polyps Study Group. Incidence and risk factor of fundic gland polyp and hyperplastic polyp in long-term proton pump inhibitor therapy: a prospective study in Japan. J Gastroenterol 2010;45:618-624. Labenz J, Armstrong D, Lauritsen K, et al. Esomeprazole 20 mg vs. pantoprazole 20 mg for maintenance therapy of healed erosive oesophagitis: results from the EXPO study. Aliment Pharmacol Ther 2005;22:803-811. Kinoshita Y, Kato M, Fujishiro M, et al. Efficacy and safety of twice-daily rabeprazole maintenance therapy for patients with reflux esophagitis refractory to standard once-daily proton pump inhibitor: the Japan-based EXTEND study. J Gastroenterol 2017;28:1-11. Sugano K, Choi MG, Lin JT, et al. Multinational, double-blind, randomised, placebo-controlled, prospective study of esomeprazole in the prevention of recurrent peptic ulcer in low-dose acetylsalicylic acid users: the LAVENDER study. Gut 2014;63:1061-1068. Sugano K, Kinoshita Y, Miwa H, Takeuchi T, Esomeprazole NSAID Preventive Study Group. Randomised clinical trial: esomeprazole for the prevention of nonsteroidal anti-inflammatory drug-related peptic ulcers in Japanese patients. Aliment Pharmacol Ther 2012;36:115-125. Pace F, Annese V, Prada A, et al. Rabeprazole is equivalent to omeprazole in the treatment of erosive gastro-oesophageal reflux disease. A randomised, double-blind, comparative study of rabeprazole and omeprazole 20 mg in acute treatment of reflux oesophagitis, followed by a maintenance open-label, low-dose therapy with rabeprazole. Dig Liver Dis 2005;37:741-750. Lundell LR, Dent J, Bennett JR, et al. Endoscopic assessment of oesophagitis: clinical and functional correlates and further validation of the Los Angeles classification. Gut 1999;45:172-180. Singh S, Garg SK, Singh PP, Iyer PG, El-Serag HB. Acid-suppressive medications and risk of oesophageal adenocarcinoma in patients with Barrett’s oesophagus: a systematic review and meta-analysis. Gut 2014;63:1229-1237. Hawkey CJ, Karrasch JA, Szczepañski L, et al. Omeprazole compared with misoprostol for ulcers associated with nonsteroidal antiinflammatory drugs. Omeprazole versus misoprostol for NSAID-induced ulcer management (OMNIUM) study group. N Engl J Med 1998;338:727-734. Yeomans ND, Tulassay Z, Juhász L, et al. A comparison of omeprazole with ranitidine for ulcers associated with nonsteroidal antiinflammatory drugs. Acid suppression trial: ranitidine versus omeprazole for NSAID-associated ulcer treatment (ASTRONAUT) study group. N Engl J Med 1998;338:719-726. Sugano K, Kontani T, Katsuo S, et al. Lansoprazole for secondary prevention of gastric or duodenal ulcers associated with long-term non-steroidal anti-inflammatory drug (NSAID) therapy: results of a prospective, multicenter, double-blind, randomized, double-dummy, active-controlled trial. J Gastroenterol 2012;47:540-552. Choi SW, Han JM, Bae YJ, et al. Lessons from two cases of anaphylaxis to proton pump inhibitors. J Clin Pharm Ther 2012;37:614-616. Dury S, Nardi J, Gozalo C, Lebargy F, Deslee G. Agranulocytosis induced by proton pump inhibitors. J Clin Gastroenterol 2012;46:859. Zaccardi F, Pitocco D, Martini F, et al. A case of esomeprazole-induced transient diabetes and hepatitis: the role of liver inflammation in the pathogenesis of insulin resistance. Acta Diabetol 2014;51:151-153. Lin CY, Wang CW, Hui CR, et al. Delayed-type hypersensitivity reactions induced by proton pump inhibitors: a clinical and in vitro T-cell reactivity study. Allergy 2017;73:221-229. Tröger U, Reiche I, Jepsen MS, Huth C, Bode-Böger SM. Esomeprazole-induced rhabdomyolysis in a patient with heart failure. Intensive Care Med 2010;36:1278-1279. Shimura S, Hamamoto N, Yoshino N, et al. Diarrhea caused by proton pump inhibitor administration: comparisons among lansoprazole, rabeprazole, and omeprazole. Curr Ther Res Clin Exp 2012;73:112-120. Keszthelyi D, Jansen SV, Schouten GA, et al. Proton pump inhibitor use is associated with an increased risk for microscopic colitis: a case-control study. Aliment Pharmacol Ther 2010;32:1124-1128. Umeno J, Esaki M, Nuki Y, Kim H, Kitazono T, Matsumoto T. Letter: lansoprazole consumption is more common in Japanese patients with collagenous colitis. Aliment Pharmacol Ther 2013;38:208-209. Mori S, Kadochi Y, Luo Y, et al. Proton pump inhibitor induced collagen expression in colonocytes is associated with collagenous colitis. World J Gastroenterol 2017;23:1586-1593. Capurso G, Marignani M, Attilia F, et al. Lansoprazole-induced microscopic colitis: an increasing problem? Results of a prospective case-series and systematic review of the literature. Dig Liver Dis 2011;43:380-385. Torpey N, Barker T, Ross C. Drug-induced tubulo-interstitial nephritis secondary to proton pump inhibitors: experience from a single UK renal unit. Nephrol Dial Transplant 2004;19:1441-1446. Berney-Meyer L, Hung N, Slatter T, Schollum JB, Kitching AR, Walker RJ. Omeprazole-induced acute interstitial nephritis: a possible Th1–Th17-mediated injury?. Nephrology (Carlton) 2014;19:359-365. Muriithi AK, Leung N, Valeri AM, et al. Biopsy-proven acute interstitial nephritis, 1993–2011: a case series. Am J Kidney Dis 2014;64:558-566. Lazarus B, Chen Y, Wilson FP, et al. Proton pump inhibitor use and the risk of chronic kidney disease. JAMA Intern Med 2016;176:238-246. Xie Y, Bowe B, Li T, Xian H, Balasubramanian S, Al-Aly Z. Proton pump inhibitors and risk of incident CKD and progression to ESRD. J Am Soc Nephrol 2016;27:3153-3163. Arora P, Gupta A, Golzy M, Patel N, Carter RL, Jalal K, Lohr JW. Proton pump inhibitors are associated with increased risk of development of chronic kidney disease. BMC Nephrol 2016;17:112. Klatte DCF, Gasparini A, Xu H, et al. Association between proton pump inhibitor use and risk of progression of chronic kidney disease. Gastroenterology 2017;153:702-710. Nochaiwong S, Ruengorn C, Awiphan R, et al. The association between proton pump inhibitor use and the risk of adverse kidney outcomes: a systematic review and meta-analysis. Nephrol Dial Transplant 2017;33:331-342. Moledina DG, Perazella MA. PPIs and kidney disease: from AIN to CKD. J Nephrol 2016;29:611-616. 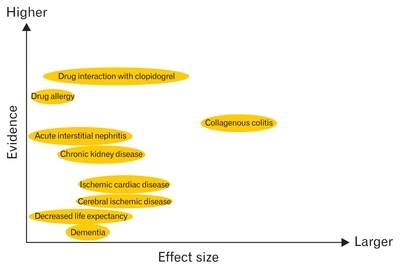 Chen J, Chen S, Lian J, Zeng X, Luo T. Pharmacodynamic impacts of proton pump inhibitors on the efficacy of clopidogrel in vivo-a systematic review. Clin Cardiol 2013;36:184-189. Funck-Brentano C, Szymezak J, Steichen O, et al. Effects of rabeprazole on the antiplatelet effects and pharmacokinetics of clopidogrel in healthy volunteers. Arch Cardiovasc Dis 2013;106:661-671. Hokimoto S, Mizobe M, Akasaka T, et al. Impact of CYP2C19 polymorphism and proton pump inhibitors on platelet reactivity to clopidogrel and clinical outcomes following stent implantation. Thrombosis Research 2014;133:599-605. Zhu P, Gao Z, Tang XF, et al. Impact of proton-pump inhibitors on the pharmacodynamic effect and clinical outcomes in patients receiving dual antiplatelet therapy after percutaneous coronary intervention: a propensity score analysis. Chin Med J 2017;130:2899-2905. Ho PM, Maddox TM, Wang L, et al. Risk of adverse outcomes associated with concomitant use of clopidogrel and proton pump inhibitors following acute coronary syndrome. JAMA 2009;301:937-944. O’Donoghue ML, Braunwald E, Antman EM, et al. Pharmacodynamic effect and clinical efficacy of clopidogrel and prasugrel with or without a proton-pump inhibitor: an analysis of two randomised trials. Lancet 2009;374:989-997. Simon T, Steg PG, Gilard M, et al. Clinical events as a function of proton pump inhibitor use, clopidogrel use, and cytochrome P450 2C19 genotype in a large nationwide cohort of acute myocardial infarction: results from the French registry of acute ST-elevation and non-ST-elevation myocardial infarction (FAST-MI) registry. Circulation 2011;123:474-482. Serbin MA, Guzauskas GF, Veenstra DL. Clopidogrel-proton pump inhibitor drug-drug interaction and risk of adverse clinical outcomes among PCI-treated ACS patients: a meta-analysis. J Manag Care Spec Pharm 2016;22:939-947. Melloni C, Washam JB, Jones WS, et al. Conflicting results between randomized trials and observational studies on the impact of proton pump inhibitors on cardiovascular events when coadministered with dual antiplatelet therapy: systematic review. Circ Cardiovasc Qual Outcomes 2015;8:47-55. Bhatt DL, Cryer BL, Contant CF, et al. Clopidogrel with or without omeprazole in coronary artery disease. N Engl J Med 2010;363:1909-1917. Gao QP, Sun Y, Sun YX, Wang LF, Fu L. Early use of omeprazole benefits patients with acute myocardial infarction. J Thromb Thrombolysis 2009;28:282-287. Ren YH, Zhao M, Chen YD, et al. Omeprazole affects clopidogrel efficacy but not ischemic events in patients with acute coronary syndrome undergoing elective percutaneous coronary intervention. Chin Med J 2011;124:856-861. Haenisch B, von Holt K, Wiese B, et al. Risk of dementia in elderly patients with the use of proton pump inhibitors. Eur Arch Psychiatry Clin Neurosci 2015;265:419-428. Gomm W, von Holt K, Thomé F, et al. Association of proton pump inhibitors with risk of dementia: a pharmacoepidemiological claims data analysis. JAMA Neurol 2016;73:410-416. Badiola N, Alcalde V, Pujol A, et al. The proton-pump inhibitor lansoprazole enhances amyloid beta production. PLoS One 2013;8:e58837. Lochhead P, Hagan K, Joshi AD, et al. Association between proton pump inhibitor use and cognitive function in women. Gastroenterology 2017;153:971-979, e4. Goldstein FC, Steenland K, Zhao L, Wharton W, Levey AI, Hajjar I. Proton pump inhibitors and risk of mild cognitive impairment and dementia. J Am Geriatr Soc 2017;65:1969-1974. Taipale H, Tolppanen AM, Tiihonen M, Tanskanen A, Tiihonen J, Hartikainen S. No association between proton pump inhibitor use and risk of Alzheimer’s disease. Am J Gastroenterol 2017;112:1802-1808. Gray SL, Walker RL, Dublin S, et al. Proton pump inhibitor use and dementia risk: prospective population-based study. J Am Geriatr Soc 2017;66:247-253. Wang YF, Chen YT, Luo JC, Chen TJ, Wu JC, Wang SJ. Proton-pump inhibitor use and the risk of first-time ischemic stroke in the general population: a nationwide population-based study. Am J Gastroenterol 2017;112:1084-1093. Shah NH, LePendu P, Bauer-Mehren A, et al. Proton pump inhibitor usage and the risk of myocardial infarction in the general population. PLoS One 2015;10:e0124653. Tsai CF, Chen MH, Wang YP, et al. Proton pump inhibitors increase risk for hepatic encephalopathy in patients with cirrhosis in a population study. Gastroenterology 2017;152:134-141. Xie Y, Bowe B, Li T, Xian H, Yan Y, Al-Aly Z. Risk of death among users of proton pump inhibitors: a longitudinal observational cohort study of United States veterans. BMJ Open 2017;7:e015735. Vaezi MF, Yang YX, Howden CW. Complications of proton pump inhibitor therapy. Gastroenterology 2017;153:35-48. Bjorkman DJ. Proton pump inhibitors and chronic kidney disease: causation or another false alarm?. Gastroenterology 2017;153:638-640. Liu W, Baker SS, Trinidad J, et al. Inhibition of lysosomal enzyme activities by proton pump inhibitors. J Gastroenterol 2013;48:1343-1352. Laheij RJ, Sturkenboom MC, Hassing RJ, Dieleman J, Stricker BH, Jansen JB. Risk of community-acquired pneumonia and use of gastric acid-suppressive drugs. JAMA 2004;292:1955-1960. Gulmez SE, Holm A, Frederiksen H, Jensen TG, Pedersen C, Hallas J. Use of proton pump inhibitors and the risk of community-acquired pneumonia: a population-based case-control study. Arch Intern Med 2007;167:950-955. Sarkar M, Hennessy S, Yang YX. Proton-pump inhibitor use and the risk for community-acquired pneumonia. Ann Intern Med 2008;149:391-398. Johnstone J, Nerenberg K, Loeb M. Meta-analysis: proton pump inhibitor use and the risk of community-acquired pneumonia. Aliment Pharmacol Ther 2010;31:1165-1177. Estborn L, Joelson S. Occurrence of community-acquired respiratory tract infection in patients receiving esomeprazole: retrospective analysis of adverse events in 31 clinical trials. Drug Saf 2008;31:627-636. Filion KB, Chateau D, Targownik LE, et al. Proton pump inhibitors and the risk of hospitalisation for community-acquired pneumonia: replicated cohort studies with meta-analysis. Gut 2014;63:552-558. Sultan N, Nazareno J, Gregor J. Association between proton pump inhibitors and respiratory infections: a systematic review and meta-analysis of clinical trials. Can J Gastroenterol 2008;22:761-766. Williams C, McColl KE. Review article: proton pump inhibitors and bacterial overgrowth. Aliment Pharmacol Ther 2006;23:3-10. Laine L, Ahnen D, McClain C, Solcia E, Walsh JH. Review article: potential gastrointestinal effects of long-term acid suppression with proton pump inhibitors. Aliment Pharmacol Ther 2000;14:651-668. Bavishi C, Dupont HL. Systematic review: the use of proton pump inhibitors and increased susceptibility to enteric infection. Aliment Pharmacol Ther 2011;34:1269-1281. Brophy S, Jones KH, Rahman MA, et al. Incidence of Campylobacter and Salmonella infections following first prescription for PPI: a cohort study using routine data. Am J Gastroenterol 2013;108:1094-1100. Faleck DM, Salmasian H, Furuya EY, Larson EL, Abrams JA, Freedberg DE. Proton Pump Inhibitors Do Not Increase Risk for Clostridium difficile Infection in the Intensive Care Unit. Am J Gastroenterol 2016;111:1641-1648. Khanna S, Aronson SL, Kammer PP, Baddour LM, Pardi DS. Gastric acid suppression and outcomes in Clostridium difficile infection: a population-based study. Mayo Clin Proc 2012;87:636-642. Shivashankar R, Khanna S, Kammer PP, et al. Clinical factors associated with development of severe-complicated Clostridium difficile infection. Clin Gastroenterol Hepatol 2013;11:1466-1471. Linsky A, Gupta K, Lawler EV, Fonda JR, Hermos JA. Proton pump inhibitors and risk for recurrent Clostridium difficile infection. Arch Intern Med 2010;170:772-778. Freedberg DE, Salmasian H, Friedman C, Abrams JA. Proton pump inhibitors and risk for recurrent Clostridium difficile infection among inpatients. Am J Gastroenterol 2013;108:1794-1801. Lundell L, Vieth M, Gibson F, Nagy P, Kahrilas PJ. Systematic review: the effects of long-term proton pump inhibitor use on serum gastrin levels and gastric histology. Aliment Pharmacol Ther 2015;42:649-663. Campana D, Ravizza D, Ferolla P, et al. Risk factors of type 1 gastric neuroendocrine neoplasia in patients with chronic atrophic gastritis. A retrospective, multicentre study. Endocrine 2017;56:633-638. Lamberts R. Morphological changes of the human gastric mucosa under long-term proton pump inhibitor therapy and their clinical relevance. Microsc Res Tech 2000;48:357-366. Delle Fave G, Capurso G, Annibale B, Panzuto F. Gastric neuroendocrine tumors. Neuroendocrinology 2004;80(suppl 1):16-19. Yu JY, Wang LP, Meng YH, Hu M, Wang JL, Bordi C. Classification of gastric neuroendocrine tumors and its clinicopathologic significance. World J Gastroenterol 1998;4:158-161. Sato Y, Imamura H, Kaizaki Y, et al. Management and clinical outcomes of type I gastric carcinoid patients: retrospective, multicenter study in Japan. Dig Endosc 2014;26:377-384. Olbe L, Carlsson E, Lindberg P. A proton-pump inhibitor expedition: the case histories of omeprazole and esomeprazole. Nat Rev Drug Discov 2003;2:132-139. Dawson R, Manson JM. Omeprazole in oesophageal reflux disease. Lancet 2000;356:1770-1771. Haga Y, Nakatsura T, Shibata Y, et al. Human gastric carcinoid detected during long-term antiulcer therapy of H2 receptor antagonist and proton pump inhibitor. Dig Dis Sci 1998;43:253-257. Chiba T, Fukui H, Kinoshita Y. Reg protein: a possible mediator of gastrin-induced mucosal cell growth. J Gastroenterol 2000;35(suppl 12):52-56. Kinoshita Y, Ishihara S, Kadowaki Y, Fukui H, Chiba T. Reg protein is a unique growth factor of gastric mucosal cells. J Gastroenterol 2004;39:507-513. Gillen D, Wirz AA, Ardill JE, McColl KE. Rebound hypersecretion after omeprazole and its relation to on-treatment acid suppression and Helicobacter pylori status. Gastroenterology 1999;116:239-247. Poitras P, Gingras MH, Rehfeld JF. The Zollinger-Ellison syndrome: dangers and consequences of interrupting antisecretory treatment. Clin Gastroenterol Hepatol 2012;10:199-202. Jackson MA, Goodrich JK, Maxan ME, et al. Proton pump inhibitors alter the composition of the gut microbiota. Gut 2016;65:749-756. Imhann F, Bonder MJ, Vich Vila A, et al. Proton pump inhibitors affect the gut microbiome. Gut 2016;65:740-748. Lo WK, Chan WW. Proton pump inhibitor use and the risk of small intestinal bacterial overgrowth: a meta-analysis. Clin Gastroenterol Hepatol 2013;11:483-490. William JH, Danziger J. Proton-pump inhibitor-induced hypomagnesemia: current research and proposed mechanisms. World J Nephrol 2016;5:152-157. Hoorn EJ, van der Hoek J, de Man RA, Kuipers EJ, Bolwerk C, Zietse R. A case series of proton pump inhibitor-induced hypomagnesemia. Am J Kidney Dis 2010;56:112-116. Biyik M, Solak Y, Ucar R, et al. Hypomagnesemia among outpatient long-term proton pump inhibitor users. Am J Ther 2017;24:e52-e55. Cheungpasitporn W, Thongprayoon C, Kittanamongkolchai W, et al. Proton pump inhibitors linked to hypomagnesemia: a systematic review and meta-analysis of observational studies. Ren Fail 2015;37:1237-1241. Bai JPF, Hausman E, Lionberger R, Zhang X. Modeling and simulation of the effect of proton pump inhibitors on magnesium homeostasis. 1.Oral absorption of magnesium. Mol Pharm 2012;9:3495-3505. Koop H, Bachem MG. Serum iron, ferritin, and vitamin B12 during prolonged omeprazole therapy. J Clin Gastroenterol 1992;14:288-292. Stewart CA, Termanini B, Sutliff VE, et al. Iron absorption in patients with Zollinger-Ellison syndrome treated with long-term gastric acid antisecretory therapy. Aliment Pharmacol Ther 1998;12:83-98. Hutchinson C, Geissler CA, Powell JJ, Bomford A. Proton pump inhibitors suppress absorption of dietary non-haem iron in hereditary haemochromatosis. Gut 2007;56:1291-1295. Vanclooster A, van Deursen C, Jaspers R, Cassiman D, Koek G. Proton pump inhibitors decrease phlebotomy need in HFE hemochromatosis: double-blind randomized placebo-controlled trial. Gastroenterology 2017;153:678-680, e2. Wood RJ, Serfaty-Lacrosniere C. Gastric acidity, atrophic gastritis, and calcium absorption. Nutr Rev 1992;50:33-40. Hansen KE, Jones AN, Lindstrom MJ, et al. Do proton pump inhibitors decrease calcium absorption?. J Bone Miner Res 2010;25:2786-2795. Ngamruengphong S, Leontiadis GI, Radhi S, Dentino A, Nugent K. Proton pump inhibitors and risk of fracture: a systematic review and meta-analysis of observational studies. Am J Gastroenterol 2011;106:1209-1218. Yu EW, Blackwell T, Ensrud KE, et al. Acid-suppressive medications and risk of bone loss and fracture in older adults. Calcif Tissue Int 2008;83:251-259. Gray SL, LaCroix AZ, Larson J, et al. Proton pump inhibitor use, hip fracture, and change in bone mineral density in postmenopausal women: results from the Women’s Health Initiative. Arch Intern Med 2010;170:765-771. Targownik LE, Lix LM, Leung S, Leslie WD. Proton-pump inhibitor use is not associated with osteoporosis or accelerated bone mineral density loss. Gastroenterology 2010;138:896-904. Targownik LE, Leslie WD, Davison KS, et al. The relationship between proton pump inhibitor use and longitudinal change in bone mineral density: a population-based study [corrected] from the Canadian Multicentre Osteoporosis Study (CaMos). Am J Gastroenterol 2012;107:1361-1369. Kaye JA, Jick H. Proton pump inhibitor use and risk of hip fractures in patients without major risk factors. Pharmacotherapy 2008;28:951-959. Corley DA, Kubo A, Zhao W, Quesenberry C. Proton pump inhibitors and histamine-2 receptor antagonists are associated with hip fractures among at-risk patients. Gastroenterology 2010;139:93-101. Hirschowitz BI, Worthington J, Mohnen J. Vitamin B12 deficiency in hypersecretors during long-term acid suppression with proton pump inhibitors. Aliment Pharmacol Ther 2008;27:1110-1121. Attwood SE, Ell C, Galmiche JP, et al. Long-term safety of proton pump inhibitor therapy assessed under controlled, randomised clinical trial conditions: data from the SOPRAN and LOTUS studies. Aliment Pharmacol Ther 2015;41:1162-1174. Lam JR, Schneider JL, Zhao W, Corley DA. Proton pump inhibitor and histamine 2 receptor antagonist use and vitamin B12 deficiency. JAMA 2013;310:2435-2442. Hartman B, Donnelly-VanderLoo M, Watson T, O’Connor C, Madill J. Proton-pump inhibitor therapy and vitamin B12 status in an inpatient hospital setting. Appl Physiol Nutr Metab 2016;41:1071-1076. Jalving M, Koornstra JJ, Wesseling J, Boezen HM, DE Jong S, Kleibeuker JH. Increased risk of fundic gland polyps during long-term proton pump inhibitor therapy. Aliment Pharmacol Ther 2006;24:1341-1348. Ally MR, Veerappan GR, Maydonovitch CL, et al. Chronic proton pump inhibitor therapy associated with increased development of fundic gland polyps. Dig Dis Sci 2009;54:2617-2622. Tran-Duy A, Spaetgens B, Hoes AW, de Wit NJ, Stehouwer CD. Use of proton pump inhibitors and risks of fundic gland polyps and gastric cancer: systematic review and meta-analysis. Clin Gastroenterol Hepatol 2016;14:1706-1719, e5. Torbenson M, Lee JH, Cruz-Correa M, et al. Sporadic fundic gland polyposis: a clinical, histological, and molecular analysis. Mod Pathol 2002;15:718-723. Choudhry U, Boyce HW, Coppola D. Proton pump inhibitor-associated gastric polyps: a retrospective analysis of their frequency, and endoscopic, histologic, and ultrastructural characteristics. Am J Clin Pathol 1998;110:615-621. Kuipers EJ, Lundell L, Klinkenberg-Knol EC, et al. Atrophic gastritis and Helicobacter pylori infection in patients with reflux esophagitis treated with omeprazole or fundoplication. N Engl J Med 1996;334:1018-1022. Brunner G, Athmann C, Schneider A. Long-term, open-label trial: safety and efficacy of continuous maintenance treatment with pantoprazole for up to 15 years in severe acid-peptic disease. Aliment Pharmacol Ther 2012;36:37-47. Poulsen AH, Christensen S, McLaughlin JK, et al. Proton pump inhibitors and risk of gastric cancer: a population-based cohort study. Br J Cancer 2009;100:1503-1507. Brusselaers N, Wahlin K, Engstrand L, Lagergren J. Maintenance therapy with proton pump inhibitors and risk of gastric cancer: a nationwide population-based cohort study in Sweden. BMJ Open 2017;7:e017739. Wennerström ECM, Simonsen J, Camargo MC, Rabkin CS. Acid-suppressing therapies and subsite-specific risk of stomach cancer. Br J Cancer 2017;116:1234-1238. Cheung KS, Chan EW, Wong AYS, Chen L, Wong ICK, Leung WK. Long-term proton pump inhibitors and risk of gastric cancer development after treatment for Helicobacter pylori: a population-based study. Gut 2018;67:28-35. Colucci R, Blandizzi C, Tanini M, Vassalle C, Breschi MC, Del Tacca M. Gastrin promotes human colon cancer cell growth via CCK-2 receptor-mediated cyclooxygenase-2 induction and prostaglandin E2 production. Br J Pharmacol 2005;144:338-348. Takhar AS, Eremin O, Watson SA. The role of gastrin in colorectal carcinogenesis. Surgeon 2004;2:251-257. Singh M, Dhindsa G, Friedland S, Triadafilopoulos G. Long-term use of proton pump inhibitors does not affect the frequency, growth, or histologic characteristics of colon adenomas. Aliment Pharmacol Ther 2007;26:1051-1061. Yang YX, Hennessy S, Propert K, Hwang WT, Sedarat A, Lewis JD. Chronic proton pump inhibitor therapy and the risk of colorectal cancer. Gastroenterology 2007;133:748-754. Robertson DJ, Larsson H, Friis S, Pedersen L, Baron JA, Sørensen HT. Proton pump inhibitor use and risk of colorectal cancer: a population-based, case-control study. Gastroenterology 2007;133:755-760. Yu T, Tang Y, Jiang L, Zheng Y, Xiong W, Lin L. Proton pump inhibitor therapy and its association with spontaneous bacterial peritonitis incidence and mortality: a meta-analysis. Dig Liver Dis 2016;48:353-359. Khan MA, Kamal S, Khan S, Lee WM, Howden CW. Systematic review and meta-analysis of the possible association between pharmacological gastric acid suppression and spontaneous bacterial peritonitis. Eur J Gastroenterol Hepatol 2015;27:1327-1336. Dam G, Vilstrup H, Watson H, Jepsen P. Proton pump inhibitors as a risk factor for hepatic encephalopathy and spontaneous bacterial peritonitis in patients with cirrhosis with ascites. Hepatology 2016;64:1265-1272. Kim JH, Lim KS, Min YW, et al. Proton pump inhibitors do not increase the risk for recurrent spontaneous bacterial peritonitis in patients with cirrhosis. J Gastroenterol Hepatol 2017;32:1064-1070. Terg R, Casciato P, Garbe C, et al. Proton pump inhibitor therapy does not increase the incidence of spontaneous bacterial peritonitis in cirrhosis: a multicenter prospective study. J Hepatol 2015;62:1056-1060. Okamoto E, Amano Y, Fukuhara H, et al. Does gastroesophageal reflux have an influence on bleeding from esophageal varices?. J Gastroenterol 2008;43:803-808. Hidaka H, Nakazawa T, Wang G, et al. Long-term administration of PPI reduces treatment failures after esophageal variceal band ligation: a randomized, controlled trial. J Gastroenterol 2012;47:118-126. Goh KL, Choi MG, Hsu PI, et al. Pharmacological and safety profile of dexlansoprazole: a new proton pump inhibitor-implications for treatment of gastroesophageal reflux disease in the Asia Pacific region. J Neurogastroenterol Motil 2016;22:355-366. Xie C, Sifrim D, Li Y, Chen M, Xiao Y. Esophageal baseline impedance reflects mucosal integrity and predicts symptomatic outcome with proton pump inhibitor treatment. J Neurogastroenterol Motil 2018;24:43-50. Freedberg DE, Kim LS, Yang YX. The risks and benefits of long-term use of proton pump inhibitors: expert review and best practice advice from the American Gastroenterological Association. Gastroenterology 2017;152:706-715.